The average Social Security retirement beneficiary will receive an additional $252 in 2013. For all retired workers receiving Social Security retirement benefits the average monthly benefit of $1,240/mo. 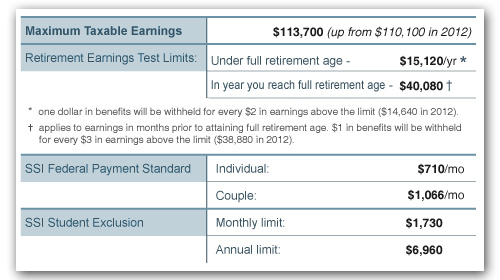 in 2012 will become $1,261/mo. in 2013. SSI (Supplemental Security Income) is the standard payment for people in need. 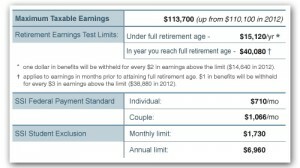 To qualify for this payment you must have little income and few resources ($2,000 if single/$3,000 if married). A full-time student who is blind or disabled can still receive Supplemental Security Income (SSI) benefits as long as earned income does not exceed the student exclusion amounts listed above. Warning: There’s also a 2% withholding increase! Note: The above tax rates are a combination of Social Security (4.20% in 2012; 6.20% in 2013) and 1.45% for Medicare. There is also a Medicare .9% wages surtax that is scheduled to begin in 2013 for those with wages above $200,000 single ($250,000 joint filers) that is not reflected in the 2013 figures. Please recall that your employer also pays Social Security and Medicare taxes on your behalf. These figures are reflected in the self-employed tax rates, as self-employed individuals pay both halves of the tax.